At the end of the seventh century Dorestad, situated near present Wijk bij Duurstede in the central part of the Netherlands, functioned as the centre of a flourishing North-Sea trade network (Jansma & Van Lanen 2016). Located near the rivers Rhine and Lek it was important to the Frisian- and Carolingian world and many other parts of north-western Europe. Excavations at Dorestad started in the 1960s and have continued for decades. Dendrochronology was applied to its water wells and foundation piles in 1972-1974 at the Institute for Wood Biology (now Zentrum Holzwirtschaft) at Hamburg University, in 1990 at the Dutch national archaeological service ROB (predecessor of the current Cultural Heritage Agency of the Netherlands (RCE)), and in 1996-1997 and 2009-2011 at the Netherlands Centre for Dendrochronology/RING Foundation. The early research at Hamburg University already showed that many oak barrels re-used as water wells in Dorestad had been assembled in the German Rhineland (Eckstein et al. 1969). The material archive of the Dorestad excavations at present is stored in the depot of the National Museum of Antiquities (RMO) in The Hague. Storing and unlocking new results using the DCCD repository (see Section 5.3; Jansma et al. 2010; Jansma 2013), in order to facilitate more follow-up research. Twelve well-preserved and as yet unanalysed oak samples were selected for dendrochronological analysis, focussing on relatively early structures in Dorestad. None of these samples contain sapwood, which implies that successful dating only can result in terminus post quem (tpq) dates of the calendar years in which the trees were felled. Of this group two samples could be dated absolutely, yielding tpq dates after AD 489 and 643. Sample metadata were administrated using the MS Access format TRiDaBASE database following the requirements of TRiDaS (table 1; sections 2.1 and 2.3; Jansma et al. 2010). Using TRiDaBASE the metadata were exported to XML, which was uploaded to the DCCD together with the measurement series. The results were stored in the DCCD using the project identifier P:2011501 (Figs. 1-7), with the default level of access set at 'value (download)'. This access level ensures all DCCD members have full access to and can download the project file including the measurement series. Although the reanalysis of existing data did not result in new dates, it did enable the identification of elements derived from the same individual tree. In addition we noted a marked discrepancy between the end dates of staves from the same individual barrels (up to a hundred years; Jansma & Van Lanen 2016). This indicates that the dendrochronological date of barrels cannot be determined with any accuracy by studying only a limited number of staves, which due to financial considerations, amongst others, is quite common in archaeological research. Table 1: TRiDaS-based metadata administered within project P:2011501 (also see Figs. 1 to 7). 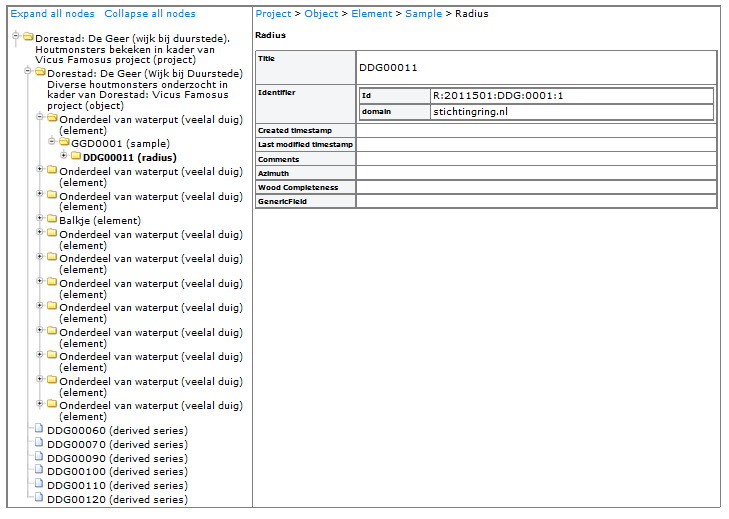 The inventory of individual wood finds from Dorestad consists of three parts (table 2): (a) an inventory of wooden finds from Dorestad; (b) an overview of dendrochronological data from Dorestad-De Geer and Dorestad-Veilingterrein developed at RCE and the RING Foundation in the Netherlands (subset); (c) an overview of dendrochronological data developed at the Institute for Wood Biology at Hamburg University in Germany (subset). At the Institute for Wood Biology, 647 samples derived from fifty-three individual water wells and at least one jetty were analysed (Jansma & Van Lanen 2016), with the majority of these samples having been taken from staves (619). This research resulted in the dating of 235 samples. Since the Institute for Wood Biology did not grant access to the actual measurement series we could not include these in the subsequent analyses. At RCE and the RING Foundation, 251 oak samples had been analysed of which 156 samples had been dated. 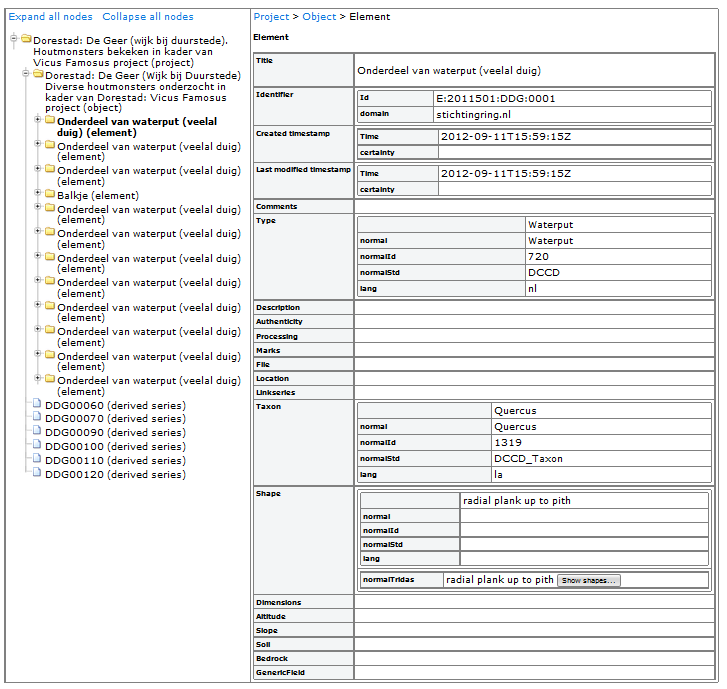 The basic Dorestad inventory was imported into TRiDaBASE, which was used to add metadata such as object type, exact find location and calendar dates. It should be noted that limited metadata were available from the Institute for Wood Biology (table 2, lower part). 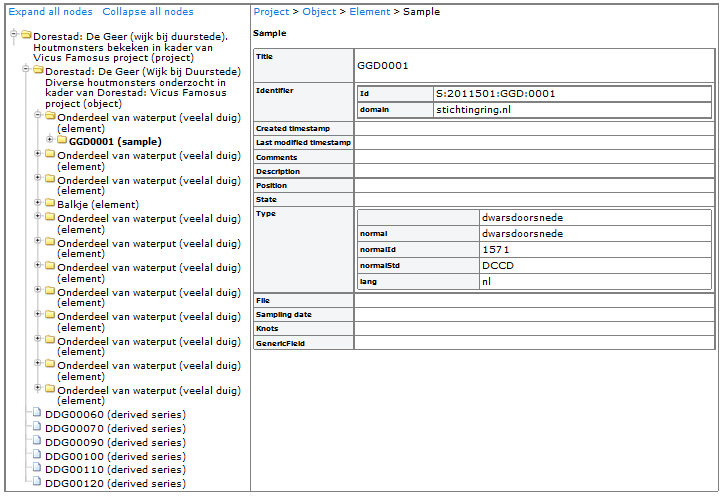 After conversion to XML, the Dorestad inventory was stored in the DCCD under project identifier P:2012501 with the default access level set at 'Value (download)'. Table 2: Fields used in the inventory of wooden finds from Dorestad. All archaeological tree-ring data developed between the 1970s and 2010 by tree-ring laboratories located in the Netherlands were archived in the DCCD repository in 2010-2012. This work involved, among other elements, digitising measurement series and research reports, and reformatting digital measurement files. Associated metadata were improved and expanded according to the fields defined by TRiDaS using TRiDaBASE. Compare tables 3 and 1 for a practical example of the recent metadata enrichment executed at RCE and the RING Foundation. Table 3: Metadata recorded in the dendrochronological database of the RING Foundation, created in 2004. Before 2004 this organisation only recorded dendrochronological metadata in research reports. The DCCD was queried to create an overview of accessible projects from The Netherlands containing dendrochronological series of which the youngest measured growth ring dates between AD 500 and 900 (Jansma & Van Lanen 2016, 142-144). A summary of the results was downloaded in XML, which was ingested into Microsoft Excel (table 4). Bulk uploading and downloading is not possible yet when using the DCCD repository, therefore all project files were downloaded from the DCCD individually, using the Excel project overview as a reference to manage the work flow. The associated individual measurement series were read into the PAST4 computer system (Knibbe 2008) using alphabetically organised folders named after the respective DCCD project identifiers. Undated series were removed and series representing the same tree were identified and averaged to ensure that each series in the dataset represented a different tree. Timber groups were identified using the dendrochronological approach outlined in Jansma et al. 2014. As a final step, average chronologies were calculated from the series in established timber groups with the aim to facilitate future dendrochronological dating and provenance studies pertaining to the early Middle Ages. Table 4: TRiDaS-based fields in project summaries downloaded from the DCCD repository. The results confirm that Dorestad partook in a long-distance exchange network that was based in the German Rhineland (Jansma & Van Lanen 2016). Early-medieval river vessels and barrels from this area found their way to Dorestad and Utrecht, further west to the Dutch coast (Oegstgeest and Katwijk), and even to Leeuwarden in the north and Brugge (Belgium) in the south. The geographical distribution of the barrels and the fact that a dugout canoe and a river barge have the same exogenous provenance shows that the Rhine was used as a transport corridor from the German Rhineland towards the northwest/west. The felling dates of the timbers show that the German-Rhineland network was already in existence early in the 7th century. The chronological distribution of the felling dates indicates that Early-medieval Oegstgeest may have predated Dorestad as a member of this distribution network. We have found no dendrochronological evidence that this network still existed in the second half of the 9th century. There are two approaches to archiving timber groups and average chronologies in the DCCD repository, both of which differ in terms of labour and cost. The TRiDaS data model allows digital linkage of individual measurement series (field: measurementSeries) to average chronologies (field: derivedSeries). For the present study this level of data accuracy requires that a new project is uploaded to the DCCD containing all series underlying the German-Rhineland chronology, as well as the chronology itself. This approach can be labour intensive since it requires that all relevant TRiDaS fields are administrated from Project down to measurementSeries level. A faster, digitally less accurate method is to limit the use of TRiDaS to the Project and Object levels. 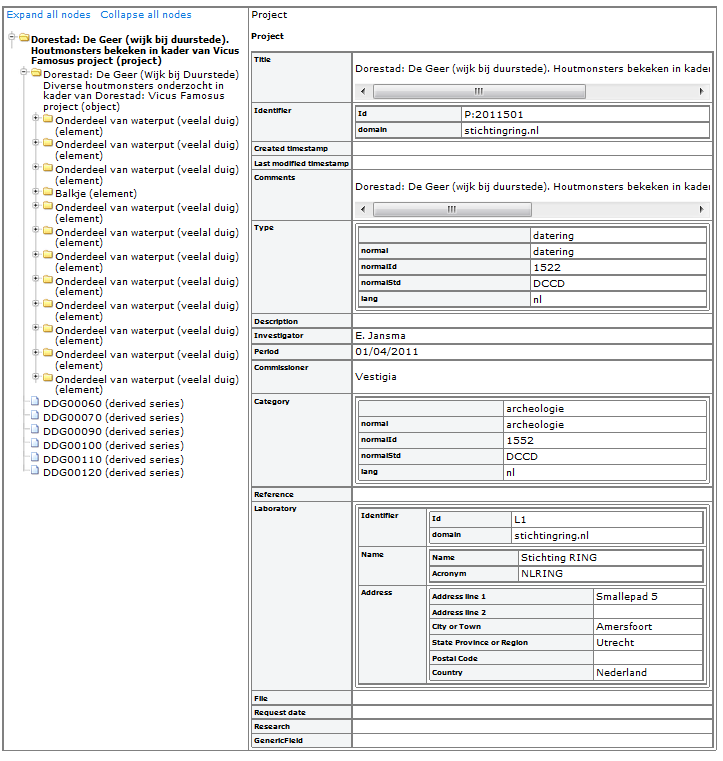 Files containing references to relevant DCCD projects and measurementSeries, and containing research results such as the description and annual values of an average chronology, should be specified in the 'files' form in one of these levels. This approach requires discipline since revised interpretations of e.g. wood provenance should be added to the original project files stored in the DCCD. Because the series used in this case study already had been archived in the DCCD we chose the second approach. 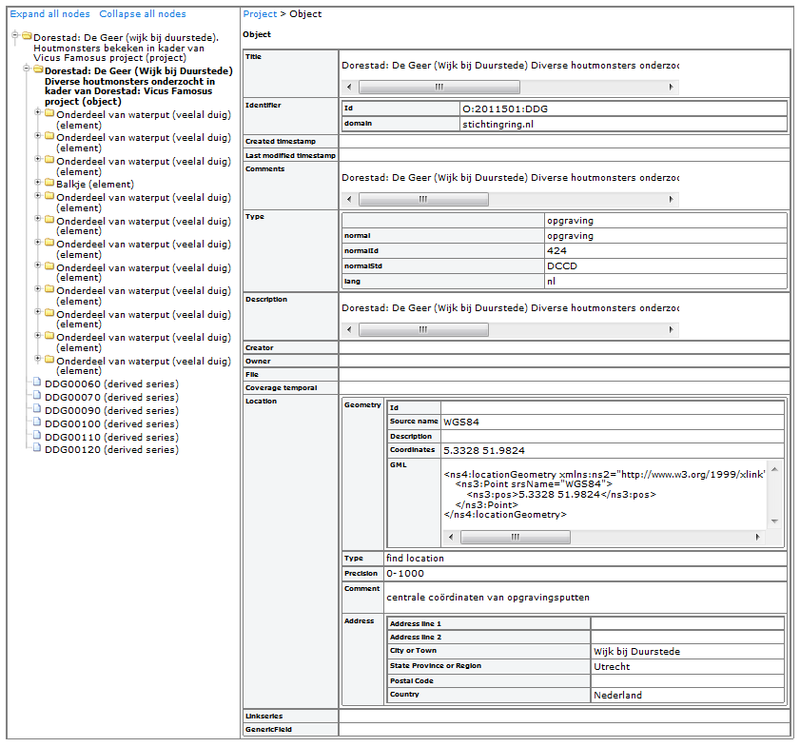 In TRiDaBASE we created a new project (P:2015503), added the Object level, and described the research and associated files in the Project and Object comment fields. The associated files were administrated in the 'files' form of the Object level. This ensures that the DCCD user interface recognises these files and during uploading of the XML will require that these files are uploaded as well. The access level of the project was set at 'Value (download)'. For other Early-medieval data stored in the DCCD some adaptations of the geographical interpretations (stored in measurementSeries level under 'Interpretation') are forthcoming. Based on the success of dendrochronological inter-site analyses using the DCCD (Jansma et al. 2014; Jansma & Van Lanen 2016), all Dutch-based data in this repository with end dates ranging from 100 BC to 1100 AD managed by the RCE and RING Foundation now have been reanalysed. The results have been combined with recently-developed geospatial reconstructions of former Roman and Early-medieval route networks in the Netherlands (Van Lanen et al. 2015a; Van Lanen et al. 2015b) and have been compared to the (shifting) spatio-chronological distribution patterns of non-locally produced ceramics and stone household goods in this region (Van Lanen et al., 2016). The results show that interdisciplinary archaeological research using large datasets such as those combined in the DCCD can lead to significant new insights about the former landscape, economy, and long-distance connections in north-western Europe. The DCCD repository was funded by the Netherlands Organisation for Scientific Research (NWO section Humanities; 2006-2014), RCE, and DANS (Data Archiving and Networked Services, of the Netherlands Royal Academy of Sciences). We are very grateful to the many researchers who made their data available through this repository. The inventory of individual wood finds and dendrochronological time series from Dorestad was created in the context of the research project Dorestad: Vicus Famosus (funded by NWO). Follow-up dendrochronological research took place within this project and within the NWO/Humanities-funded research programme The Dark Age of the Lowlands in an interdisciplinary light: people, landscape and climate in the Netherlands between AD 300 and 1000 (Utrecht University; 2012-2019). Part of the research in 2011-2012 was funded by RCE and the RING Foundation. This case study in part summarizes and/or quotes Jansma & Van Lanen (2016). TRiDaBASE was developed for dendrochronological metadata management and interaction with the DCCD repository (Jansma et al. 2012b) and can be downloaded from http://www.tridas.org/tridabase/ . At present TRiDaBASE only runs under 32 bits, which limits the use of this application. 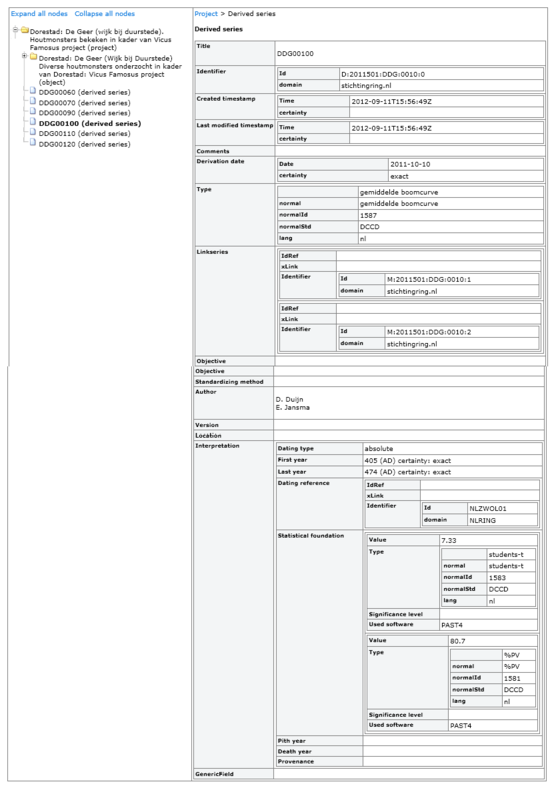 S. Wröbel of the Institute for Wood Biology in 2011 provided us with a digital list of structures and samples plus their dendrochronological end dates. This research at the RING Foundation for a large part was executed by students under supervision of E. Jansma and M. Domínguez-Delmás (De Natris 2009; Zandbergen 2010; Pedro Pinto Andrade 2011). 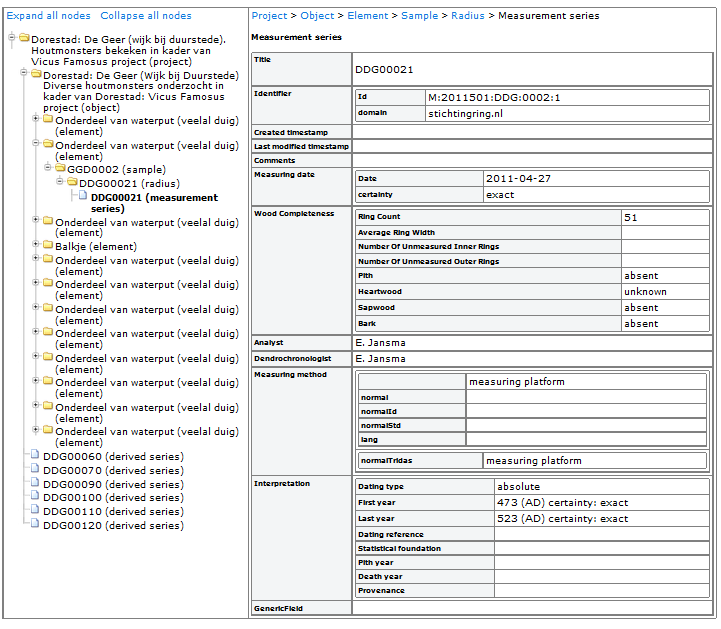 The Digital Collaboratory for Cultural Dendrochronology (DCCD) repository can be accessed at http://dendro.dans.knaw.nl . This digital and searchable dendrochronological archive stores data from cultural and natural heritage including archaeology developed in many European countries. For the Netherlands at present it contains data developed at Amsterdam University, RCE (and its predecessors ROB and RDMZ), the RING Foundation, Wageningen University and private companies BAAC BV, BIAX Consult, Van Daalen Dendrochronologie and Preßler GmbH Planung und Bauforschung. Membership is free and can be acquired using the registration button in the top right corner of the DCCD home page. Please note that registration details are verified before a membership application is accepted.